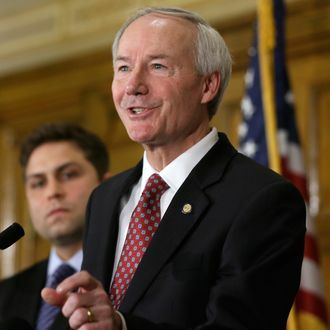 After watching Indiana be rebuked by other state leaders, corporations, sports organizations, nonprofits, and celebrities for two days, Governor Asa Hutchinson decided not to sign a similar religious-freedom bill passed by Arkansas’s state legislature. He said that he wanted Arkansas “to be known as a state that does not discriminate but understands tolerance” and asked lawmakers to craft something new “similar to what is at the federal level” before he’ll consider it. Walmart happens to be based in Arkansas, and it publicly opposed the law.